Look what I just pulled off of Niner. Ewww - and yes that is a nice chunk of Niner's skin that disgusting creature has in his mouth. I am thoroughly grossed out now. Yuck. Good job getting it out whole. I was just remarking to someone yesterday how big a chunk of skin ticks can hang on to when you remove them. I'd found one walking up my leg. Although I know it's wasting water, I give them a burial at sea also- flush goes the weasel! At least you found it! UGH! I hate these creatures. Luckily spring is over, so there are less ticks around. Gah. We've picked a lot of ticks off Kimber, but luckily few were attached. Yuck. Love to burn them and watch them "pop". I know horrible to say, but, Hate those things with a passion. Disgusting, plus some types are disease carriers that will devastate a healthy animal or human. Glad you found it. Poor Niner. That's disgusting! 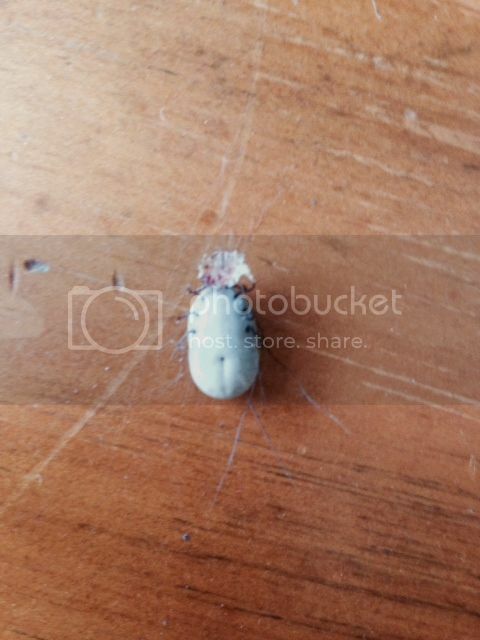 I've never seen a tick that looks like that. That's what it is, isn't it? Georgia, when ticks attach and engorge, that's what you get. Disgusting, eh?